Cet article paraîtra le 29 octobre 2019. Lewis Carroll’s beloved classic stories are reimagined in this deluxe illustrated gift edition from the award-winning design studio behind the graphics for the Harry Potter film franchise, MinaLima—designed with stunning full color artwork and several interactive features. Originally published in 1865, Lewis Carroll’s exquisite Alice’s Adventures in Wonderland & Through the Looking-Glass have remained revered classics for generations. The story of Alice, an inquisitive heroine who falls through a rabbit hole and into a whimsical world, has captured the hearts of readers of all ages. Perhaps the most popular female character in English literature, Alice is accompanied on her journey of trials and tribulations by the frantic White Rabbit, the demented and terrifying Queen of Hearts, the intriguing Mad Hatter, and many other eccentric characters. This keepsake illustrated edition—the sixth book in Harper Design’s series of illustrated children’s classics—will be treasured by for years to come. 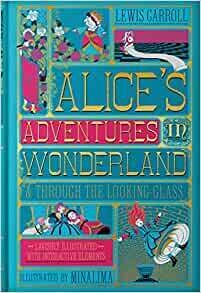 Précommander Alice's Adventures in Wonderland & Through the Looking-Glass pour votre Kindle aujourd'hui.